The Spanish Civil War prompted many memorable responses in all art forms, but none of these came close to matching the extraordinary impact of Picasso’s Guernica, inspired by the German Condor Legion’s destruction of the Basque town of Guernica on 26 April 1937. Guernica‘s searing images made it one of the iconic works of art of the twentieth century, and an archetypal representation of the destructiveness of war. Yet paradoxically the Spaniard Pablo Picasso, then living in France, did not at first seem to respond to the war – artistically, at least – with quite the same immediacy as many of his contemporaries. Although Picasso experts agree that the painter’s interest in the war as a subject was sparked some time in late 1936 or early 1937, the precise circumstances of the “conversion” that made the Guernica possible were never fully made clear—until now, that is. Last year, while preparing an edition of the Spanish Civil War reporting by the now largely forgotten French journalist Louis Delaprée, I came across new materials that I believe help us to pin down the exact turning point in Picasso’s career. Key, it turned out, was the publication in Paris of a collection of Delaprée’s dispatches from Spain on 8 January 1937. For one, it was precisely then that Picasso started his first clearly political response to events in Spain: a two-part engraving entitled Dream and Lie of Franco. As I further explored the impact of Delaprée’s writing on Picasso, I also became convinced that visual imagery from the journalist’s descriptions of the bombing of Madrid had left very clear traces in the Guernica. My edition of Delaprée, Morir en Madrid, was published last fall; in a recent issue of the New York Review of Books, the distinguished art historian John Richardson included a review of the book as part of a wide-ranging study of Picasso’s political attitudes. But Richardson’s article also revealed a further important twist in the plot, which I will discuss below. First, however, it is necessary to reflect on the representation in the Western media of civilian bombing during the Spanish Civil War. You’ve only published half my articles. I know that. It’s your right. But I’d have thought that out of friendship you’d have spared me some useless work. For the last three weeks, I’ve been getting up every day at five in the morning, so that you could get the news into your first editions. You’ve had me working for the King of Prussia and the waste paper basket. Thanks. I’ll fly back on Sunday unless I suffer the same fate as Guy de Traversay, and that’d be fine, wouldn’t it? Because that way you’d have your own martyr. Until then, I won’t send you anything else. Not worth it. The killing of a hundred Spanish kids is less interesting than a sigh from Mrs Simpson, the royal whore. As it turned out, this message was premonitory. The French embassy plane on which Delaprée was returning was shot down, and he died in Madrid on 11 December 1936. Paul Preston has studied the process by which many basically conservative journalists who worked in Spain came to identify with the Republican cause. That identification often led to confrontations with their more right-wing newspaper proprietors. Delaprée’s conflict with his newspaper was not therefore unique, but it certainly had many unusual features, not least its bitterness and remarkable aftermath. 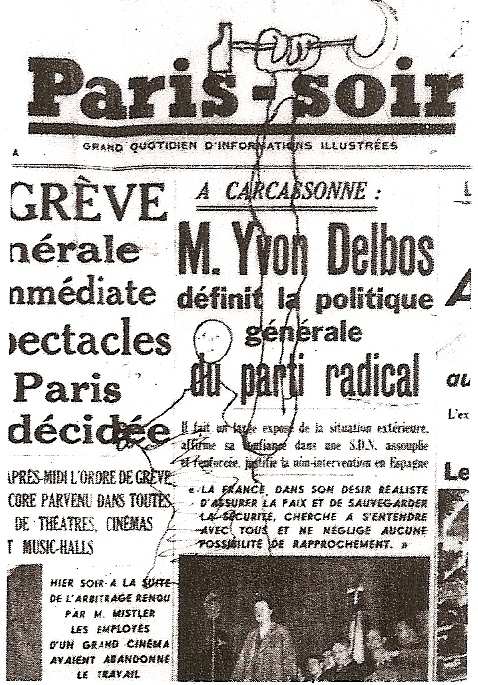 Copies of Delaprée’s dispatches, which had been filed in the Republican censorship office in Madrid, made their way to the French Communist newspaper L’Humanité. This provenance makes it likely that their ensuing publication as a 48-page pamphlet was part of a wider Republican propaganda initiative that we know the Minister of State, Julio Álvarez del Vayo, was planning in late December 1936. On 30 December, L’Humanité teased its readers by promising “sensational” forthcoming revelations, and that very evening Delaprée’s melancholy face looked down from posters with the text “A dead man denounces the lies of the press”. 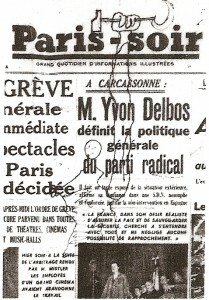 Delaprée’s last desperate message to his editors was reproduced on the poster and in L’Humanité (31 December 1936). The Delaprée case was fast becoming a cause célèbre. As details emerged about the attack on the plane, the testimony of the pilot and the passengers, including the Red Cross envoy Dr Georges Henny, contradicted the initial hypothesis of Francoist responsibility. Other theories were now advanced, notably that documentation on Republican repression was being prevented from reaching Geneva. But although the attack may well have been committed by Soviet pilots, what were their instructions? A photo of the plane’s wreckage keeps open the possibility of a blunder due to mistaken identification. To make matters even murkier, the fascist writer Brasillach launched the outlandish accusation that the writer André Malraux was responsible for Delaprée’s death. Brasillach also claimed that L’Humanité was softening up the market for a pro-Communist evening newspaper. This charge was was less fanciful, as Ce Soir was indeed launched in March 1937, with financing from the Spanish Republican government. Meanwhile, a selection of Delaprée’s dispatches, Le Martyre de Madrid (The Martyrdom of Madrid), was published in Paris on 8 January 1937, and subsequently translated into English, Spanish, German and Russian. Although prepared in haste, this pamphlet had a clear political purpose. 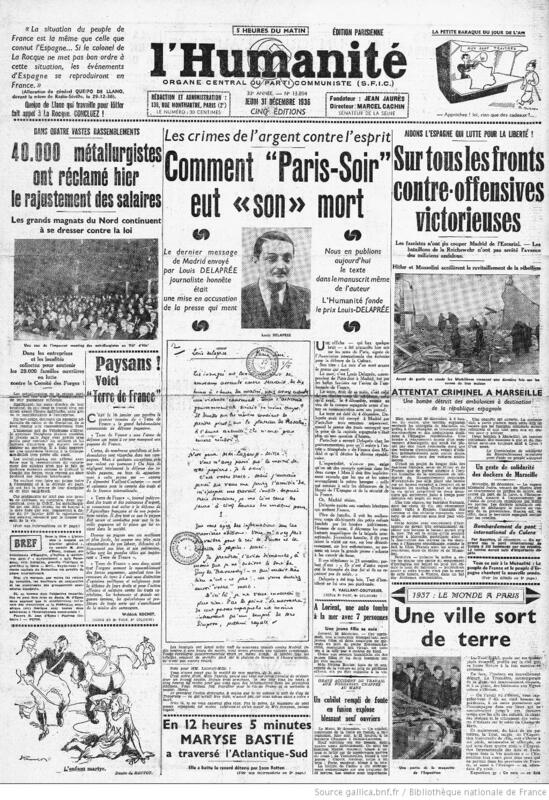 While it purported to show the differences between the original and truncated reports, several allegedly censored passages had in fact been published in Paris-Soir. More importantly, the pamphlet omitted altogether one report that included an unflattering reference to the Madrid security police, as well as Delaprée’s scathing allusion to the royal whore. The latter omission was certainly deliberate, as public opinion in both Britain and France was a vital overseas battlefield for the Spanish Republic. The Martyrdom of Madrid produced a riposte in February 1937 when circles linked to Paris-Soir brought out a second collection of Delaprée’s work, Mort en Espagne (Dead in Spain), which offered a fuller selection of his journalism while downplaying its political impact. By this stage, the Paris-Soir team had clearly grown wary of accusations of censorship, and provided reasonably complete versions of Delaprée’s reports (although there are significant textual differences between the first edition and a reprint in April). Even so, the editors could not bring themselves to republish Delaprée’s final incendiary dispatch. To one contemporary reviewer, this seemed to close the cycle. Who was Louis Delaprée? Although he has only attracted very sporadic attention, J. B. Romeiser hailed him nearly 30 years ago as a precursor of the “new journalism” of the 1960s in the way that he broke down the separation between self and subject, sacrificing total objectivity to empathy. He was an acknowledged influence on Virginia Woolf, who kept a copy of The Martyrdom of Madrid among her press cuttings while she wrote Three Guineas. Delaprée’s spirit also presides over André Malraux’s novel L’Espoir. There are numerous echoes of Delaprée’s writing in the novel, with some of Delaprée’s passages even inserted verbatim. Malraux and Delaprée knew each other, and were not particularly friendly, ostensibly because of Malraux’s hostility towards the “bourgeois” journalism of Paris-Soir. 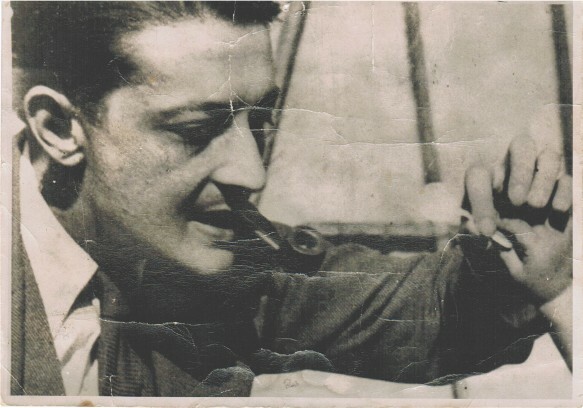 In fact, the two men were probably too similar to get on well – they were also physically alike – while the false accusation that Malraux had killed the journalist cannot have simplified his feelings about him. Although I could find no mention of Delaprée in studies of Picasso, I found several strong indications of the likely impact of the Delaprée affair on the painter’s significant change in orientation leading up to the Guernica. For one, the Communist poet Louis Aragon was both a prime mover in the Delaprée affair and a close friend of Picasso’s. So too was Paul Eluard, whose poem on “November 1936″ has been cited as a possible influence on Picasso, but may also be connected to the sequence of events related here. Picasso read L’Humanité every day. More important, we know that something related to Spain had deeply affected Picasso on 8-9 January 1937 when he began Dream and Lie of Franco, parts I and II, a fantastic, burlesque representation of Franco in a Golden Age setting. “Bather under a black sun”, a drawing of 9 January, has also been linked to his unease about Spain. 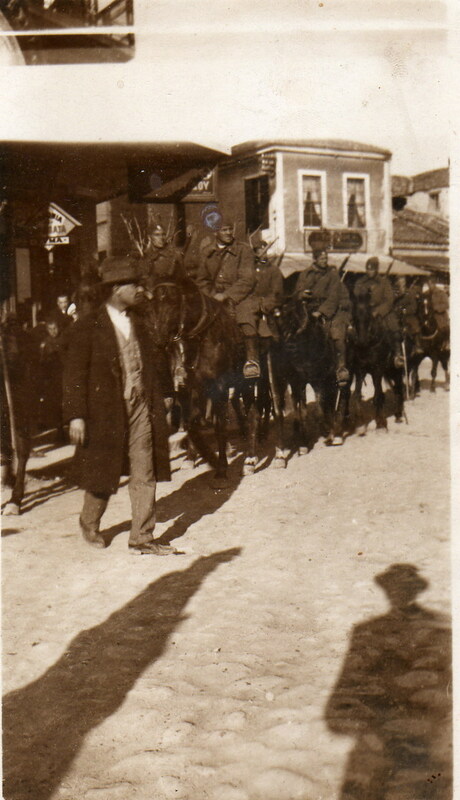 Delaprée in Nationalist territory, some time before August 2, 1936. Unpublished photo from the Lincoln-Delaprée collection. Curiously, Delaprée was championed by Picasso’s Communist friends as an “honest” journalist fighting the lies of the press; yet he was also respected by the Right who saw him as one of their own. Given Picasso’s known antipathy to agitprop, had a centre-right journalist’s writing helped to redefine the bombings in human, apolitical terms? As Delaprée’s political attitudes are clearly relevant to this discussion, some of the wilder theories about him need to be laid to rest. Geoffrey Cox’s account in Defence of Madrid (1937) shows that towards the end of his time in Madrid Delaprée was widely suspected of being a fifth columnist – clearly by those who had not read his suppressed writing. A lifetime later, Sir Geoffrey Cox wrote to me that “Louis Delaprée was suspected of being a Fascist because he worked for Paris-Soir, a paper the Republicans regarded as Fascist, that was the case with the rest of us. It was common in the tense atmosphere of Madrid for such suspicions to be held.” In this instance, however, we do not have to rely on such late testimony because there is contemporaneous evidence that that his alleged right-wing sympathies were causing him problems in Republican territory. On the other hand, the suggestion that he was a crypto-communist, put forth by Robert Stradling, probably derives from the posthumous connection to L’Humanité. In any case, Stradling offers no evidence in support of this contention, which dovetails with his more general theory that the foreign correspondents were, first and foremost, propagandists. In this period, several French writers, including Georges Bernanos and André Gide, took “pride in practicing politics with their hearts”, and reacted to their experiences in Spain and Russia in ways that belied their nominal political sympathies. It took a very young Albert Camus to insist that there was no need to pretend that Bernanos was anything other than what he really was, a right-wing, Catholic monarchist. So there is nothing inherently implausible in Delaprée being both a ferocious critic of Franco, and the journalist who wrote disdainfully that leftists spoke about fascism “with the same horror with which a monk of the Middle Ages would speak of the Devil”. Delaprée’s clash with his newspaper is, I believe, a furious personal and humanistic rebellion against the constraints of commercial journalism. Some biographical details may be helpful. Delaprée was born in Brittany in 1902, and the loss of his father in the First World War may have reinforced a restless strain that was characteristic of a whole generation of young French intellectuals, the so-called “non-conformists of the 1930s”. Delaprée trained as a lawyer and dabbled in centre-right politics before going into journalism in Paris. Brilliant and charming, he also had a fierce temper. On one occasion he punched the press magnate, Léon Bailby, and he maintained this flair for making life complicated by having an affair with Hélène Gordon, the girlfriend and future wife of his boss Pierre Lazareff at Paris-Soir. Delaprée’s light, brilliant pre-war journalism included a report on a melancholy song that was claimed to have caused a wave of suicides in Hungary. Delaprée brought the words and music back to France, and they were translated and adapted overnight to become the song Sombre Dimanche. (The English version, Gloomy Sunday, followed quickly, and is best known in Billie Holiday’s marvelous version.) At this stage, this kind of human interest story, and Paris-Soir’s commercial journalism, were a perfect match. When the Spanish Civil War broke out, Delaprée immediately told Lazareff that he wanted to go to Spain, invoking his part-Spanish ancestry. He would be in Spain, with some interruptions, from 22 July until his death in December 1936. During a brief stay in rebel territory at the beginning of the war, Delaprée sent a report that condemned atrocities on both sides, but provided detailed information on Nationalist killings near Burgos. From a short additional note, we know that Delaprée probably never expected this dispatch to be published, but he nevertheless felt compelled to write it. This surely is the best proof of its authenticity. I have studied all of Delaprée’s reports from Spain, and during the early months of the war the overall picture is one of a conscientious and balanced reporter who signposts the more doubtful information he receives so that readers can make up their own minds. But Delaprée loses this composure in Madrid. By late November, Delaprée is on the other side of the mirror. He is no longer a working journalist, he is writing for himself. Madrid is a besieged island: “I hope nobody takes it amiss that I say ‘we‘. Living with people under a bombardment makes you feel incredibly close to them.” We are witnessing the experiential transformation of the journalist. Other, more pragmatic journalists worked in upbeat, colorful details – the aerial combats, the rescue of art treasures – to make the carnage more palatable to a mass readership. There is none of this in Delaprée. But his subjectivity makes it harder for us to vouchsafe for each factual detail. If we want balanced, informative descriptions of the bombings by working journalists we should look elsewhere. Moreover, from internal evidence, it is clear that “Bombs over Madrid“, the article translated here, was – unusually for Delaprée – written over two or three days, permitting him to rework his material, and achieve a more personal interpretation of what he had seen and experienced. It is not difficult to imagine the effect that this writing had on Picasso when Delaprée’s writing was published on 8 January 1937. Nothing quite like this had come out of Spain, and certainly not in such dramatic circumstances. Picasso began Part I of Dream and Lie on the very same day. This work has been linked to Goya’s The Sleep of Reason Creates Monsters, but after reading Delaprée, Goya’s engraving becomes the eeriest premonition of a nocturnal aerial bombardment as winged night-monsters, owls and bats attack a dormant figure from the sky. “Bombs over Madrid” has a special claim on our attention. After its publication in the pamphlet on 8 January 1937, it was reprinted in L’Humanité on the following day, so Picasso saw it at least twice. As it turned out, after Paris-Soir´s rejection Delaprée had published it under a pseudonym in a moderate left-wing weekly, Marianne. But Marianne had cut out its final sentences, allowing L’Humanité on 9 January once again to make front page news out of the scandal of the “lying press”. Scholars have invoked the possible influence of Golden Age dramatist Calderón de la Barca’s exploration of the nature of illusion on Picasso’s Dream and Lie. Perhaps: but on the 8th and 9th January when he began it, the linked themes of lies and a murderous Franco were very much closer to hand in a newly printed pamphlet and on the front page of Picasso’s own daily newspaper. Picasso’s sketch of a hand holding a hammer/sickle, on a copy of Paris-Soir. The single most striking image in “Bombs over Madrid“, and probably in all of Delaprée’s writing, is an electric flashlight illuminating a woman and dead child, which is also of course a central image in the Guernica. Chronologically, the reprinting of the article in L’Humanité on 9 January coincided with Dream and Lie II. Picasso depicted a prostrate woman that day, only introducing the woman and child motif at a later stage. Visually, in any case, Delaprée’s mater dolorosa is closer to the version in the Guernica, with its nocturnal, dreamlike atmosphere that so closely matches the mood of Delaprée’s writing. One of the drawings connected to the Guernica has an even more explicit allusion to Delaprée’s text, showing a woman with a sliced breast, from which a triangle of light illuminates the baby. New light was shed on Delaprée’s influence on Picasso with the publication of Richardson’s article in the NYRB, mentioned above. That article brought to light a little-known painting from 1936, Still Life with a Lamp, which represents Picasso’s very first reference to the Spanish Civil War. This shows a modern table in the center of a seemingly antique, tomb-like marble room. Richardson explains that in accordance with Picasso’s anthropomorphic imagery, a jug on the table represents Picasso himself, while a fruit bowl is his mistress Marie-Thérèse. There is a severed arm between them – the image will reappear in the Guernica – and a poster on the wall is dated 29 December. Still Life with a Lamp shows that Picasso was in on the Delaprée affair right from the very beginning. 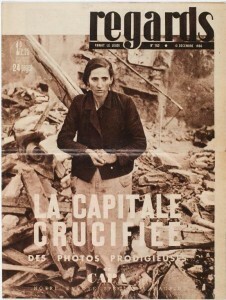 As we have seen, the affair flared up twice in Paris, the first time between 30 December 1936 and 1 January, when L’Humanité launched its poster campaign against Paris-Soir; and again on 8-9 January, when the pamphlet was published, and when L’Humanité reprinted “Bombs over Madrid”. On 29 December circles linked to L’Humanité were busy printing the Delaprée poster, so only insiders knew about the affair at that stage. Pablo Picasso must have been one of them. As I read Richardson’s NYRB essay, and related it to my own reconstruction of the Delaprée affair, I found myself slipping between languages as additional associations suggested themselves. I asked myself: doesn’t this mean that on 29 December, Picasso must have been at the… marbre? Marbre did not only mean “marble” in the 1930s, it also referred to the table on which newspapers were set and corrected, as well as to finished newspaper articles that were ready for publication. Is there submerged wordplay, then, in the painting’s depiction of a table – or perhaps marbre – within a marble mausoleum that is haunted by a dead newspaperman? And is a severed arm not the perfect visual metaphor for the silencing of a journalist, and the mutilation of his work? When the image of the severed arm reappears in the Guernica, it is just beneath scratched lines representing newsprint. Moreover, Picasso first included it in the Guernica at about the same time, to judge from Dora Maar’s photos. As Picasso must have seen the poster being printed on 29 December, the visual appearance of the street poster takes on great importance. Unfortunately, I know of no surviving copy, but it appears in the background of a photo of a crowd scene on page 1 of L’Humanité on 1 January 1937. 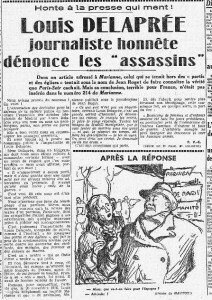 We can make out Delaprée’s face to our left, and the headline is spread out over three lines to our right: “A dead man / denounces / the lies of the press”. Beneath this, although we cannot see it in the photo, is the facsimile of Delaprée’s furious final message, which Picasso will most certainly have read, discussed, and quite possibly relished. It would be the final irony if the art historians were to decipher this imagery, only to discover that the “royal whore” was also present in this modern/antique setting. In Picasso’s painting the poster itself is blank except for the date, which is highly conspicuous. There is nothing surprising about Picasso being drawn into this affair, taken to the marbre, shown the poster, perhaps even invited to make suggestions. The Francoists had made all the running with propaganda campaigns in the early months of the war by focusing on atrocities that had been committed in Republican territory. Anti-clerical killings, in particular, had greatly damaged the Republic’s international reputation. Now, however, the Republicans were recovering lost ground, and the bombing of civilians – in Madrid but later on in Guernica and elsewhere – gave them an emotive issue which played a major role in reshaping world opinion. (The Communist news agency Agence Espagne, too, was now active in Paris, but I have no evidence of their involvement in this affair.) Here surely was an extraordinary opportunity to get Picasso fully involved. But while the pro-Republicans would certainly have been interested in attracting Picasso’s attention, they had no control over his creative response. If Picasso responded so strongly, it was surely because he was moved by Delaprée’s writing, moved by the killing of civilians. The affair reinforces, rather than diminishes, the importance of the destruction of Guernica because it demonstrates that the aerial bombing of civilians was at the very heart of Picasso’s response to the Spanish Civil War. The images discussed here had clearly entered Picasso’s creative landscape. And if Picasso reacted so furiously to the destruction of Guernica in April 1937 it was surely because he felt: they’ve done it again. Aerial bombardments were now perceived as a series of recurring and ongoing disasters, interweaving in the single, universal tragedy of the Guernica. Read the English translation of Delaprée’s “Madrid sous les bombes” here. 1. My greatest debt is to Mme Catherine Lincoln-Delaprée. I also wish to thank Professor Paul Preston and the participants at the Cañada Blanch Centre (LSE) seminar in February 2010, and Carlos García Santa Cecilia, Jaime Ruiz Reig and Mirta Núnez Díaz-Balart who participated in presentations at Gefrema and Amesde / the Blanquerna Cultural Center in Madrid. Professor Sebastiaan Faber’s detailed suggestions greatly improved an early version of this article. 2. For the influence of the Guernica, Gijs van Hensbergen, Guernica: The Biography of a Twentieth-Century Icon, London, Bloomsbury, 2004. 3. John Richardson, “How Political was Picasso?“, New York Review of Books, 25 November 2010, online at: http://www.nybooks.com/articles/archives/2010/nov/25/how-political-was-picasso/ The art historian Gijs van Hensbergen, Richardson’s collaborator, kindly sent me a pre-publication copy of the picture discussed in that article. Van Hensbergen is now working with Richardson on the fourth and concluding volume of his monumental Picasso biography, which will cover this period. 4. Herbert R. Southworth, La destruction de Guernica: Journalisme, diplomatie, propagande et histoire, Paris, Ruedo Ibérico, 1975. Southworth’s classic study settled this argument, but it has had a tenacious afterlife. 5. Simone Téry, Front de la liberté: Espagne 1937-1938, Paris, Éditions sociales internationales, 1938, p. 315. 6. Josep Maria Solé i Sabaté, y Joan Villarroya, España en llamas: La guerra civil desde el aire, Madrid, Temas de Hoy, 2003. 7. The only precedent was the Japanese air bombardment of the Chinese borough of Shanghai in 1932. But significantly, that too was viewed by Western journalists from the neighbouring International Settlement, and helped to swing world opinion against Japan. Zara Steiner, The Lights that Failed: European International History, 1919-1933, Oxford University Press, 2007 edn, pp. 731-732. 8. “Pour le roi de Prussie”: in vain. 9. The French journalist Guy de Traversay had been killed by the Francoists in Majorca. 10. “Le massacre de cent gosses espagnols est moins intéressant qu’un soupir de Mrs Simpson, putain royale.” The last two words were omitted from published versions, and disappeared from the historical literature. Pierre Lazareff, the head of Paris-Soir’s news service, later claimed that Delaprée would never have used used this kind of language. But he did: the words are perfectly visible in the facsimile that L’Humanité published on 31 December 1936. Louis Delaprée, Morir en Madrid, edited by Martin Minchom, Madrid, Raíces, 2009 (henceforth: Morir), includes fuller references than it is possible to give here. 11. Paul Preston, We Saw Spain Die: Foreign Correspondents in the Spanish Civil War, London, Constable, 2008; see also P. Knightley, The First Casualty: The War Correspondent as Hero, Propagandist, and Myth-maker from the Crimea to Iraq, London, André Deutsch, 2003 edn. Corresponsales en la Guerra de España, Madrid, Instituto Cervantes / Fundación Pablo Iglesias, 2006, includes essays by Preston and Carlos García Santa Cecilia. Noteworthy studies of French journalism include François Fontaine, La guerre d’Espagne, un déluge de feu et d’images, Paris, BDIC/ Berg International, 2003. 12. Carlos Serrano, L’enjeu espagnol: PCF et guerre d’Espagne, Paris, Messidor / Éditions sociales, 1987, pp. 91-92, although he suggested that it was connected to the launch of Ce Soir. 13. Cf. my discussion in Morir, pp. 71-77. A photo of the wreckage lent to me by Mme Lincoln-Delaprée (published in Morir, p. 82), shows that the embassy plane was still being transformed for civilian use and did not yet have the official tricolor. It displayed a single letter (F), which was characteristic of Malraux’s air squadron. 14. Robert Brasillach, “Quand demandera-t-on l’extradition d’André Malraux?”, Je suis partout, 16 January 1937. Román Gubern and Paul Hammond, Los años rojos de Luis Buñuel, Madrid, Cátedra, 2009, p. 337. 15. It was unusual for texts to be translated into so many languages, so this points to official Republican (and Communist?) backing. The French, Spanish and English pamphlets have similar formats, while the German version may have come out later. Brandeis University Library has a copy of the Russian pamphlet, which I have not seen. 16. 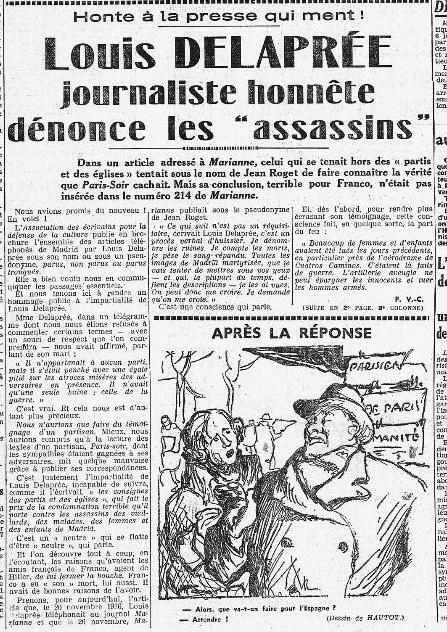 Imré Gyomai, “La foire aux livres: Louis Delaprée, mort en Espagne”, Vendredi, 26 February 1937. 17. J. B. Romeiser, “The Limits of Objective War Reporting: Louis Delaprée and Paris-Soir“, in: J. B. Romeiser, ed., Red Flags, Black Flags, Madrid, José Porrua Turanzas, 1982. 18. Discussions include Emily Dalgarno, Virginia Woolf and the Visible World, Cambridge University Press, 2001, pp. 149-178, and Robert S. Thornberry, André Malraux et l’Espagne, Geneva, Librairie Droz, 1977. 19. Information from Mme Catherine Lincoln-Delaprée. 20. The character Shade is probably a composite of Herbert Matthews and Delaprée. However, another journalist is portrayed less sympathetically, and works for a newspaper that closely resembles Paris-Soir. Malraux’s novel was first published in instalments in Ce Soir, which was launched as a pro-Communist rival to Paris-Soir. 21. I have no specific information on the Eluard poem “Novembre 1936″, which was published in L’Humanité on 17 December 1936. It begins “Regardez travailler les bâtisseurs de ruines…”, and includes the lines: “On s’habitue à tout / Sauf à ces oiseaux de plomb / Sauf à leur haine de ce qui brille…”, which I think may echo Delaprée’s “oiseaux noirs” in one of his reports. 22. Gertje R. Utley, Picasso: The Communist Years, Yale University Press, 2000, pp. 17-18, 20-21. A fine poem by Gérard de Nerval was widely known, and referred to “the black sun of melancholy”. Moreover, the poem had a Spanish title, El Desdichado: “The Ill-starred One”. 23. Picasso drew a hammer and sickle on a copy of Paris-Soir on 19 April 1937, Herschel B. Chipp, El Guernica de Picasso, Historia, transformaciones, significado, Barcelona, Polígrafa, 1991, p. 69. So he clearly perceived Paris-Soir as being the antithesis of Communism / L’Humanité. 24. Geoffrey Cox, Defence of Madrid, London, Victor Gollancz, 1937, pp. 203-206. 25. Letter of Sir Geoffrey Cox to Martin Minchom, 28 April 2007. 27. Robert Stradling, Your Children will be Next: Bombing and Propaganda in the Spanish Civil War, Cardiff, University of Wales Press, 2008, p. 119. The corresponding footnote provides only a mystifying parallel with the Communist spy Kim Philby, who never blew his cover. As I disagree with almost everything that Professor Stradling has to say in his 300-page book (with the partial exception of some issues of quantification), I will limit myself to a single point. An aerial attack on Getafe on 30 October 1936 was rapidly overshadowed by the massive aerial bombardments of Madrid, which became far bigger news. Yet Stradling argues that Getafe was the “biggest single atrocity story” after Badajoz in November 1936 (p. 232), and interprets allusions to Madrid as concealed references to Getafe. On 11 November 1936, L’Humanité observed: “Et les partisans de la “neutralité” oseront-ils regarder, sans se sentir complices, ces victimes déchirées des bombes italiennes et allemandes tombées sur Getafe et Madrid le 30 octobre 1936?” Stradling (p. 110) translates the latter part of this sentence as the “victims destroyed by Italian and German bombs that fell on Getafe”, and omits the reference to Madrid altogether! 28. Michel Winock, Le siècle des intellectuels, Paris, Seuil, 1999 edn, pp. 368, 378. 30. Jean-Louis Loubet del Bayle, Les non-conformistes des années 30, Paris, Seuil, 2001 edn. 31. My biographical data come from obituaries, and a variety of other sources; but especially from information provided to me by Mme Catherine Lincoln-Delaprée. She is both a journalist and a novelist and has written a highly readable and vivid reconstruction (forthcoming) of her late father’s final days. 32. Morir, pp. 105-108, for this previously unpublished report from Mme Lincoln-Delaprée’s collection. 34. cf. Preston, op. cit. and David Deacon, British News Media and the Spanish Civil War, Edinburgh University Press, 2008. 35. “Mother with Dead Child II”, exhibited in the Museo Nacional Centro de Arte Reina Sofía, Madrid. The museum labels this sketch “Postcripto de Guernica”. See also: “Madre con niño muerto en escalera (II)“. 37. I am following the sequence of Dora Maar’s photos as they are exhibited in the Museo Nacional Centro de Arte Reina Sofía, Madrid. 38. Hugo García Fernández, “Seis y media docena: propaganda de atrocidades y opinión británica durante la guerra civil española”, Hispania, 2007, LXVII, 226, pp. 671-692. If Prof M cares to read the relevant pages more carefully he will see that I am at some pains to stress that that Getafe was a regular target for nationalist aviation, as well as Madrid, and I admit the likelihood that both came under attack on Oct 30. My specific point is precisely the opposite of what Prof M states – viz., that Koltsov and Comintern colleagues knew that the children had been killed in Madrid but pointed propagandists like Barea et al in the direction of Getafe. Barea and British embassy officials are two of the main sources for this story, the objective being to exploit these networks to spread it worldwide. My intepretation of Delaprée’s politics is strongly influenced by the fact that in the weeks before his death (at least) he was hired by Alvarez del Vayo, the Republic’s Foreign Minister, to work alongside Margarita Nelken as goverment liaison with (e.g.) the British Parliamentary Delegation visiting Madrid (early Nov 36). In that capacity he helped convince the Brits that large areas of Madrid had been devastated by aviation (in fact Argüelles was being reduced to rubble by sustained shellfire); and that no political prisoners had been shot (the operation at Paracuellos was ongoing at the time)! As for Prof Minchom’s overall reaction to my book, I can only admire his dedication to scholarly duty in reading my 300 pages, and register surprise at his inability to find only one footnote to cite as an example of his quasi-total disagreement with my hypothesis. Surely he can locate some other little problems amongst the hundreds of original documents, dozens of archives, and an array of other sources I cite in its support. Lastly, I note the odd coincidence in timing of another attack on my book from a transatlantic direction. Prof Ruth Mackay, in the pages of the History Workshop Journal, dismisses my 300 pages as ‘incoherent’ – tout court! Not a single example of my incoherence is cited as evidence. No other public commentator – for all the delightfully mixed receptions they have received – have ever noted as much as an incoherent sentence in my ten sole-authored monographs. Are we dealing with authentic, qualified historians here? Or rather, the ideological legatees of Delaprée and Nelken? For the record, I wrote this piece quite recently, and on my own initiative. In the light of John Richardson’s work, I wanted to make Louis Delaprée’s writing, and my own material, available to anyone who wished to study Picasso’s creative response to the Spanish Civil War. I’ve never met Ruth Mackay. I readily acknowledge Professor Stradling’s energy and industry, and indeed the steadfast tenacity with which he pursues interpretations that are viewed “with distaste – even with detestation – by many dedicated to an often censorious orthodoxy” (Your Children, p. xiv). Professor Stradling is vexed by Mackay’s charge of incoherence, yet – in the posting above – he berates Delaprée for allegedly helping to “convince the Brits that large areas of Madrid had been devastated by aviation (in fact Argüelles was being reduced to rubble by sustained shellfire)”. I imagine that Professor Stradling is not denying the overwhelming evidence for massive aerial bombardments of Madrid in November 1936 (“bombing sorties of an unprecedented weight and ferocity” according to Your Children, p. 55, although not elsewhere); but a reader might think so. Perhaps the apparent contradiction is due to the confusion of dates that I discuss below. One moment Stradling hails André Malraux as “the twentieth century’s Renaissance Man” (p. 202), and the next (p. 205) it’s: “Malraux’s novel L’Espoir returns time and again to the issue of bombing, like a barking dog to its vomit.” I wouldn’t say that I view these shifting perspectives with “detestation”, but I’m certainly puzzled. Your Children’s bibliography, and many footnotes (cf. pp. 128-129), suggest that Professor Stradling’s interpretation of Delaprée’s politics is based almost entirely on internal evidence from the English version of The Martyrdom of Madrid, Madrid, 1937, which is one of the weaker editions in a flawed series. (Stradling incorrectly dates the pamphlet to 1936.) That edition is quite a mess, and many reports that were allegedly “undated” (The Martyrdom, pp. 11 – contradicted on p. 15 -, 28, 30, 39 and 43), are in fact perfectly identifiable. Professor Stradling would have been better served if he had made some use of Mort en Espagne, which includes earlier material, and contrasting reports. The atemporality of his source may explain a certain vagueness. Professor Stradling affirms (Your Children, p. 120) that “after some months” Delaprée discovered that his reports were being heavily sub-edited or going unpublished. But Delaprée’s fallout with his newspaper was actually quite a rapid business, from the second half of November to the beginning of December. In any case, it never took a working journalist weeks or months to discover that his copy was being rejected. In his posting above Professor Stradling also affirms that Delaprée was working on behalf of the Minister Álvarez del Vayo, and alongside Margarita Nelken, in Madrid in early November 1936. The date does not seem to be a slip (for late November), because the worst sacas were on 7, 8 and 9 November, and Stradling specifically states that the Paracuellos operation was ongoing at that time. But Louis Delaprée was not even in Madrid in early November. He was returning from France and missed the beginning of the full-scale attack on the city. He was not around when the worst massacres were committed. The suggestion that Delaprée was “hired” by Álvarez del Vayo is presumably based on Delaprée’s own accounts of his contact with the British delegation. But Delaprée was a working journalist. He spoke good English because he had reported on the New Deal in the United States. This was the kind of stuff that journalists wrote about. And even if there were documentary proof that Delaprée had been “hired” by Republican propagandists that would not be proof that he had covert Communist sympathies. Delaprée had certainly become anti-Francoist, and quite possibly pro-Republican, but that’s not the same thing. Delmer was a right-wing friend of LD’s, and was indeed suspected of being pro-Nazi. But Delmer never thought of Delaprée as a crypto-communist, and he too – albeit briefly – found himself identifying with the people of Madrid in the extreme conditions of November 1936. I had assumed that The Volunteer followed the fairly standard protocol of leaving a final word to the original author – to which I don’t object in principle. But if not – merely two brief sentiments. As far as it goes, Prof Minchom’s response is reasonable and acceptable. I find it even more acceptable to have inspired his further investigation of my book, regretting only that the exercise failed to reduce his absolute level of disagreement. I’m online to acknowledge Professor Stradling’s courteous response rather than to re-open the subject. Given this www’s central focus on the International Brigades, I’d like to sign off with a snippet of information that was off-topic above. Among Delaprée’s surviving papers, there was a short note in LD’s handwriting that was clearly meant to reassure a Brigader’s family. It was addressed to Roger Boucheron, 2 rue Victor Hugo, Viry Châtillon, and read simply: “Your brother’s fine. Madrid”.